"The bullet with the 'ding' cast in!" This is NOT loaded ammunition - only the bullet (the projectile). Orders are shipping on time - no back orders or delays! ALL Products proudly made in the U.S.A.! Selling quality soft cast bullets since January, 2003! OUT OF STOCK - No backorders. Sorry, we do NOT know if we will be able to get more of these or not! A new innovation for on-range repairs and adjustments. After several years of seeing gouged screw slots and buggered finish resulting from guns being ‘fixed’ on the shooting stages with inappropriate tips, the folks at TK4B decided a proper tool was needed. 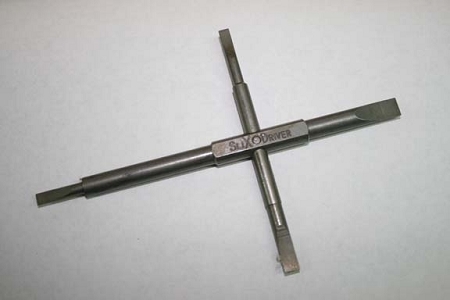 Not a “set’ with different disposable tips that get lost and a short small grip, but a tool expressly designed for a quick and positive fit for screw slots on most all of the firearms found on, and around, the line at a SASS match. Something that fits into any gun-cart and is both handy and adaptable for almost any necessity encountered. PLEASE NOTE: When ordering "As Cast" there may be a 1-2 week delay in processing because we don't always have these immediately on hand. We will ship just as soon as possible on these orders. Copyright Desperado Cowboy Bullets, LLC. All Rights Reserved. eCommerce Software by 3dcart.